Gates 6856 PoweRated V-Belts. Premium Kevlar 4L Section. 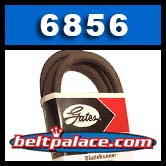 Gates 6856 PoweRated V-Belts. Kevlar 4L Section. 1/2" W x 56" L, OC. PREMIUM KEVLAR CONSTRUCTION.